Founded in 2001 by billionaire Chen Bang, Aier Eye Hospital is hoping it can replicate overseas some of the success it’s had in China. The Shenzhen-listed company is known for its network of eye hospitals in secondary cities and rural areas, establishing facilities in areas with scanty or inadequate health care. Today, the company employs 25,000 and has more than 170 locations in China, plus 76 locations in four European countries—Spain, France, Italy and Austria. The chain put $50 million toward a US subsidiary late last year, establishing a fully owned subsidiary, Aier (USA) International Holdings. In addition, the company acquired its first facility in the US for $17 million in April—Wang Eye Institute in Nashville, Tennessee. Now it’s looking for more locations, following the philosophy that set it apart in China—favouring rural markets and small cities over saturated metropolitan areas such as New York or Los Angeles. Chinese companies invested a record-breaking $53.9 billion in US companies last year, but most of that capital has been invested in real estate. According to the Rhodium Group, Chinese companies invested $3.9 billion in US health and biotech companies between 2000 and the first quarter of 2017. Compare that with the US real estate and hospitality sector, in which Chinese have invested $37.5 billion. Q. Why does Aier want to expand in the US? Aier built a conglomerate in China based in part on recognising and addressing the need for health care in rural areas. Even though the US is wealthier than China, there are many parts of the country where health care access is lacking. Aier believes it can use its experience addressing areas of need and make a difference. Q. What is the company’s strategy for tackling this new market? In a typical US eye care facility, maybe 90 percent of patients are dependent on insurance reimbursement, whereas in China, about 50 percent pay cash. That is a critical reason why Aier has been able to grow in China. In the beginning, the Chinese government didn’t like private health care groups, so for the past 15 years, Aier had very restricted access to government insurance patients. Private health care groups such as Aier had to develop elective surgeries to survive. Now the Chinese government has opened up access to government insurance patients, but 50 percent of revenue still comes from elective surgery, whereas in the US, 90 percent of revenue comes from insurance, which is subject to many changes. We’ve had a successful experience building medicine in that direction. The Aier eye clinics that we build in the US will have significant elective out-of-pocket paying procedures. More and more physicians recognise that we don’t want to be subjected to insurance rules and want to maintain autonomy. Doctors want to keep care between doctor and patient. Right now there is a third party—insurance—intervening and dictating care. That’s significantly affected the quality of care in the US and reduced doctors’ income. There is a health care trend in the US shifting to patients paying more in private care. Aier’s strategy fits with this general trend toward more cash payment. Q. US health care costs are significantly higher than elsewhere in the world for a variety of reasons. Will US consumers be able to pay out of pocket? Hospitals are closing or consolidating in rural areas for economic reasons. Many close because they didn’t make enough money or there’s a reduction in reimbursements. The result is less care in those areas now. Aier plans to address this issue with economies of scale. In many rural US areas, community hospitals depend on the economic survival of their one business. Meanwhile, Aier has been able to take full advantage of many economies of scale with electronic medical records, resource sharing and centralised equipment because of its large network. Chinese per capita is only a quarter of that of the US—the average income is maybe $3,000 to $4,000 a year—yet Aier has been able to build an eye group. Though US communities have faced reduced health care reimbursements, we believe that with economies of scale we can be successful. 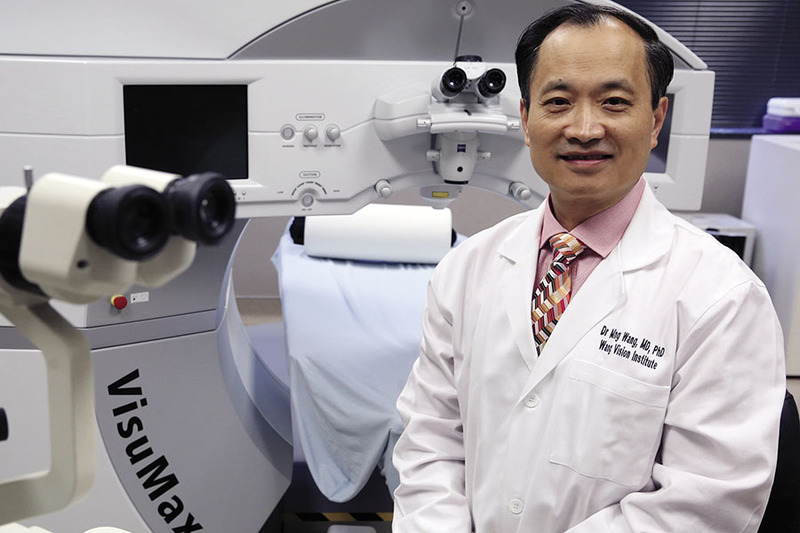 Q. Aier now has one US location, formerly Wang Eye Institute. What’s next? We are first looking at rural areas in Tennessee. We are looking for rural areas with unmet needs. In the second stage, we’ll be looking at the rest of the country and taking a similar approach. We won’t go after New York or Los Angeles, we’ll look at smaller towns. At the end of the day, it’ll be successful because of patients, so there has to be a need. In China, Aier builds about two thirds of its facilities, while the rest are acquisitions. We expect it will be more the reverse in the US It’ll be largely M&A with build-out, renovation and improvements. A typical scenario might be: We acquire a community hospital where they have not been providing eye care, add in modern technology and management and then serve that area using our unified system. We might just work on creating an eye department or convert the facility to more of an eye care focus. It will vary, but Aier’s focus remains on eye care. Q. As there’s been an increase in Chinese investments in the US, there’s also been an uptick in security concerns. Even companies and transactions that you wouldn’t think would bring up any security concerns have been shown otherwise. Has this been on Aier’s radar at all? In health care—and in eye care especially—there is no sensitive information. There is lots of sharing internationally. Doctors use the same technology in the US as they do in China. The scale of operations may be different, but the type of technology used is the same. There is no secrecy. On a different note, there has been a lot of negative sentiment toward illegal immigrants and devaluing of immigrant contributions. I believe immigrants have a lot to contribute. I’m an immigrant who wants to help and contribute to America. I came with only $50, and today I employ 26 people; I will create more jobs with Aier USA. For me, doing this project to give back and benefit America while at the same time helping Chinese build a brand here is the best thing I could be involved in.